We've come to a point in our eating of Latin foods, that I thought it only proper to post a status update and let you know how we see things in this process. As you may know from our intro article, we set out to try and answer a few questions. First, we wanted to see if we could shed any light on our American obsession with Latin eateries, specifically Mexican food. Second, we were curious about why we so seldom stop at any of the small and somewhat anonymous Latin eateries. When we finally did start settling our curiosity, what would we find. Third, we were really wondering about quality and diversity. With more than 50 small restaurants on our list, how many would actually be good and worth going back to?...and how long would we last? Fourth, does anyone really even care? I know that Mexican food is almost always well seasoned, especially the meat. Almost every dish has some sort of vegetable/bean presence (think chiles, tomatoes, radish, onion, garlic, lettuce, cilantro, and sometimes potatoes). It is easy to avoid highly processed and fried foods. The restaurants are usually owned/operated by proud, hard working folks. The food goes amazingly well with beer. So, I pose a fifth question: Is any of the above true? Finally, we want to ask you, our faithful readers a question, perhaps the most important of all: Should we continue? First, we wanted to see if we could shed any light on our American obsession with Latin eateries, specifically Mexican food. This is still a very challenging question for me to answer. Although I will pose several possibilities, I have no idea if they are true or widely accepted. The easy answer is that the food is very accessible in its simplest form. 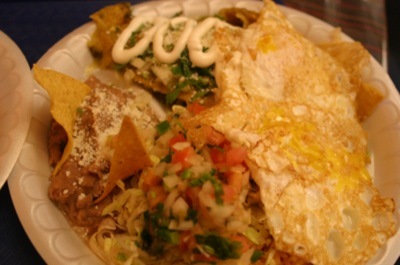 Tacos, burritos and the like are tasty, easily transportable and can appeal to anyone, young/old/picky/hungry/adventurous. Going deeper, we have had an almost consistently welcoming attitude from all of the workers and owners that we have encountered. A "language barrier" has been virtually nonexistent. That has been a big surprise, because we have been in establishments that are all owned by Latinos, most of them being the first generation in their families to live in America. That attitude makes the whole eating experience more dynamic and inviting. 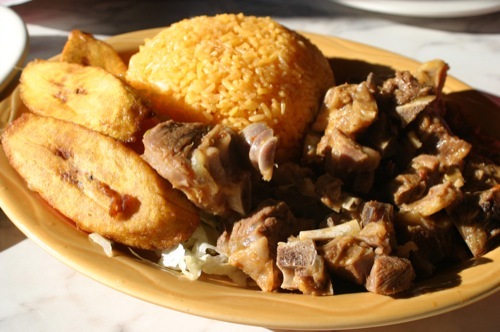 The goat stew with rice and plantains from El GuayaquilFinally, I have to say that the food has been very wholesome and nourishing. True, there can often be a lot of meat, but it is almost never deep fried and some, like tripe and tongue is often served steamed. There have been many more veggies than we expected as we have stumbled upon cabbage, plantain, hominy, yucca, in addition to all of the veggies listed above. There is also surprisingly little processed foods. Compared to many other food traditions, Latin cooking uses less refined grains, sugars and other highly processed foods. This is in part because of the fact that much of the food is made from scratch. A good example of this was the restaurant Manana. They demonstrated a great whole foods approach in their tamale sauce. It was primarily made of vegetables: carrots, green beans and the like. Second, we were curious about why we so seldom stop at any of the small and somewhat anonymous Latin eateries. When we finally did start settling our curiosity, what would we find. I have no idea why I didn't stop before. Some were obviously out of my normal range of travel, but the close ones...who knows? As for what we found? An amazing amount of ingenuity, hard working folks, pride and great food. Plus, the diversity has been amazing, from the different regions of Mexico, to Ecuador, El Salvador, Colombia and Honduras. It is quite the global world we live in. If you are curious, we have only hit dead ends twice, once with a place called the Border Cafe in West Saint Paul and another called Los Dos Puertos in NE mpls. Both appear to have closed in the past year or so. Third, we were really wondering about quality and diversity. With more than 50 small restaurants on our list, how many would actually be good and worth going back to?...and how long would we last? Chilaquiles from El Taco RiendoThe quality has surprised us. We promised to try and be positive and it has been extremely easy. True, there has been a disappointing dish here and there, but it wasn't until restaurant number 17 that we really came up against some mediocre food. Across the board, the quality has been above average, and more often than not, it has been outstanding. I credit some of this to the fact that we are very open minded and go into each establishment with no expectations. We sort of expected nothing and that left us overwhelmed with appreciation. Not only that, almost all have given us that sort of personal, eating-at-a-friends-house experience that make you want to go back and support the families cooking and serving the food. Now, the question looming is, how long could we or should we carry on? A good sign is that week in/week out, we are still excited to pick a place at random and try it out. Perhaps if we begin having more mediocre or even our first really bad experience, we may put the brakes on. That leads me to another interesting question to pose to everyone. We decided not to run the article about "number 17" as we really don't want to stomp on anyone's hard work. It is very possible that the goat taco that was too tough to chew on was an anomaly. 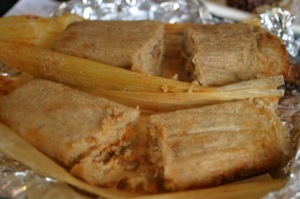 Perhaps the tamales that totally fell apart were made by someone new. They were still tasty. It just seems too pretentious and rude to give a poor review on one eating experience. What do you think? Should we have written about it? Fourth, does anyone really even care? Excellent tamales from El TaquitoA resounding yes, I think. We have gotten a pretty great response from a number of you, excited about reading the articles and about Latin foods in general. We also received a number of recommendations to try places, although I think we could still hear more. Just last week, two folks brought to our attention a place called Homi, on University and Victoria. We went, it was amazing and you will be reading about it next week. Keep it up. We have also gotten a great response from the restauranteurs as stated above. They care and really want to share their food with the world, and often their stories as well. They have also shown an interest in what we are doing and an openness to the idea of locally farmed food. So, I pose a fifth question: Is any of the above true? The food is indeed really well seasoned, from the meat to the beans and rice. More than that are the sauces and salsas. So much care goes into roasting the chiles just right, or the right amount of garlic, or perfecting a mole over many days. It is impressive to me. Yes the food has a lot of veggies. Sure there is the often present iceberg lettuce, but it is so much more than that. A big surprise is where the veggies show up...in the guisados (meat stews) and recently, potatoes in the rice. Herbs and spices abound as well, definitely worthy of mention. It is easy to avoid highly processed and fried foods. They do show up, but often as appetizers and treats, not as the main dish. Yes, yes and yes. The folks we have come across are extremely proud, hard working and present. In a little over half of the restaurants so far, the owners were on site. Most of the others had owners who responded to us when we tried to contact them, despite a lack of apparent technological savvy. 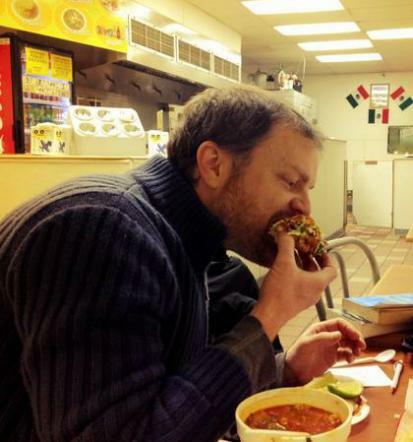 I think that the final statement is probably still true, that beer does go well with Mexican food, but since we are leaving it out of the equation, I have begun to care less and less about having a beer with my meal. My experience has become all about the food. Well, there you have it. Our adventures continue and although we may slow down the pace a bit, unless you tell us to stop, we might just carry on until our list is exhausted. Please comment below on how we are doing, whether you care or not, if we are ridiculous, or possibly if you have been holding out on a place that we have yet to visit. And again, thanks for reading and supporting your local food lovers. 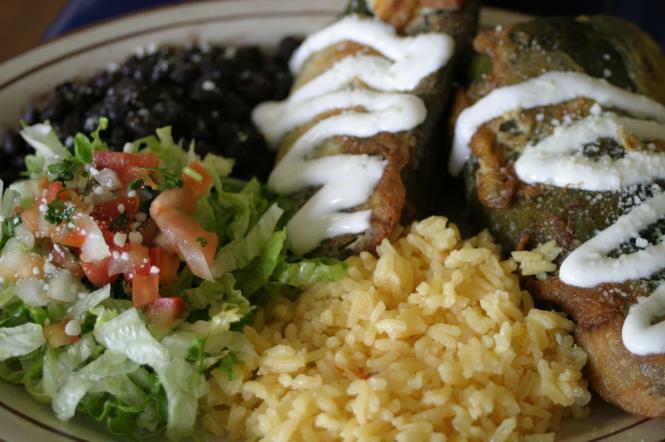 Header photo: Fresh made chile rellenos from Catalina's. Lawrence Black is a writer and editor at Simple, Good and Tasty. He can be reached at lawrence@simplegoodandtasty.com. Look for him at your local Latin eatery. He is usually found looking overwhelmed and sweating.